Some 1,884 tourism projects valued at 430 trillion rials (nearly $10.2 billion) are underway in Iran, tourism chief Ali-Asghar Mounesan said on Sunday. Projects including construction of hotels and eco-lodges as well as projects aiming at attracting tourists are already underway and herald good days for tourism industry of the country, CHTN quoted Mounesan as saying. "Importing Tourists instead of exporting Oil"
Before summer 2013 there were 125 four- and five-star hotels in the country which has risen to 158 up to now, he said, adding that the number of hotels are planned to increase to 280 within the next three years. 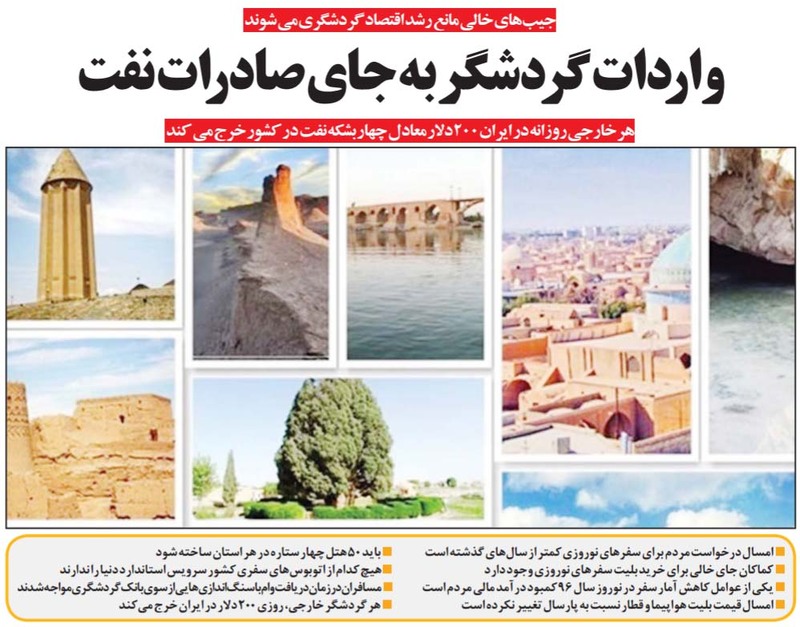 Elsewhere in his remarks, the tourism chief explained that foreign tourist arrivals in Iran has increased by 38 percent in the first four months of the current Iranian calendar year (started March 21) compared to the same period a year before. He went on to say that in the previous Iranian calendar year, international tourist arrivals in Iran rose four percent year on year. "Domestic tourism is also of importance and can become a booming market...," he added. Socially speaking, tourism and handicrafts industry have stopped people of small towns and villages to migrate to big cities and even reversed the process, Mounesan highlighted. Data provided to Fox News by leading travel intelligence analyst ForwardKeys showed that there has been a five percent growth in Westerners visiting Iran between September 1, 2016 and September 1, 2017 - and Americans make up 14.5 percent of all Western arrivals, Fox News reported in September 2017.